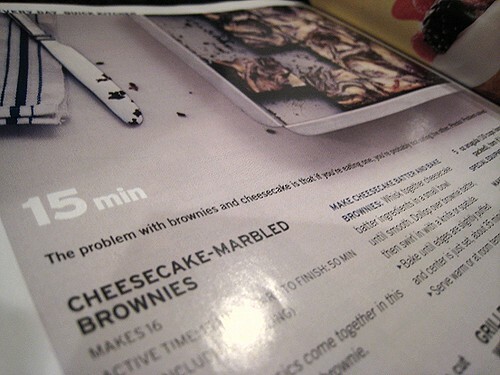 I first saw this recipe for Cheesecake-Marbled Brownies in the June 2007 issue of Gourmet magazine. I kept pointing it out to anybody who would listen, saying something like, "That sounds good." Or, "That would be good to make." Of course, being me, nothing came out of that. Then, when we were planning the party for Alice during her visit here, JS mentioned that this was a dessert we could do. Alice herself was very excited by such a possibility. But, as you can see from our Alice's Back-in-Vancouver party menu, that didn't come to pass. Months passed. The seasons changed. Yes, we've been thinking about this for a whole year. 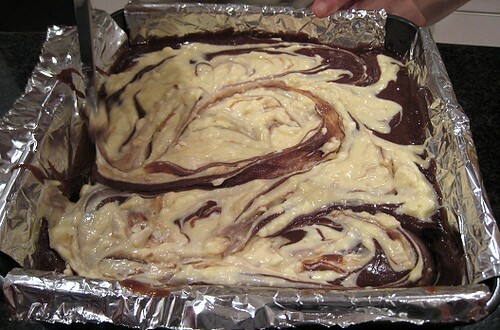 It took CSC's sudden interest in baking (thanks to America's Test Kitchen) to put making cheesecake-marbled brownies within the realm of reality. JS made this request of her. How ironic, then, that it was me who had to finish making it! 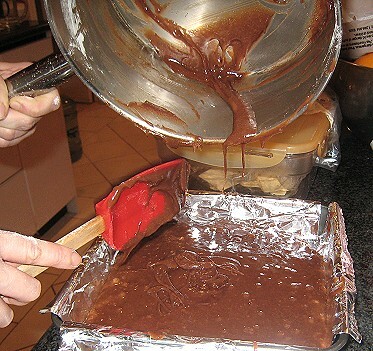 Melting butter and chocolate, then adding sugar. Not pictured was the addition of eggs and flour. Into the pan it went. 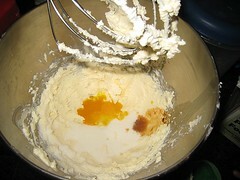 Cream cheese, sugar, egg yolks and vanilla in the Kitchen-Aid mixer and onto the brownie batter that went. I think I went a little overboard with the swirling. But, no harm done. 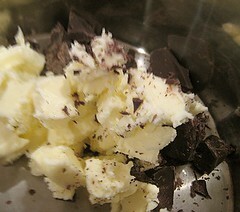 For some reason, though, ours wasn't as chocolate-y as it could've been. Maybe the chocolate was measured wrong? Is that 2 ounces in weight or in volume? We did it by weight. 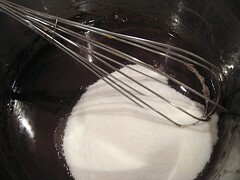 Maybe we can try putting in more chocolate or adding cocoa powder to the batter. I also wanted MORE cheesecake on it. Maybe we can just make more of that cheesecake batter to put on top. 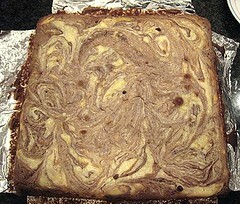 I should get CSC working on Cheesecake-Marbled Brownie Version 2. Ok, here is version 2 and 3 and more. I added chocolate chips hoping to make it more chocolate-y, but it turns out that chocolate chips MELT and become a “liquid” ingredient. So, after a loooooong baking time where the centre still wouldn’t set, I finally just pulled out the pan and let the whole thing cool, which then of course, “set” the chocolate back to solid. 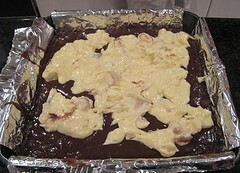 This made the brownie turned out to be more fudge-y. But that didn’t stop TS from finishing half (almost) the first night. I added 1 tbsp of cocoa powder as per TS (she told me this just after version 1, but I got confused and put choc chips instead of cocoa). So this time, I made sure it was cocoa powder. 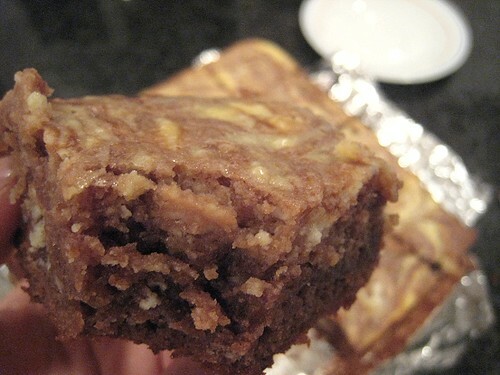 The texture of the brownie was quite nice.